Growing up can be challenging. You know what can make it more fun? Moving to a new town as a vampire with a host of magical skills! Vamperina might not know the ins and outs of life as a normal child. She struggles when it comes to little girl-life in Pennsylvania. When it comes to getting badges in her Woodchuck Woodsie group, she just can't seem to get anything right. When she does a bird call all she gets are bats. And don't get us started in on cookie sales. Try selling cookies door to door when your parents are vampires! Everyone knows you can't invite them in, or else. It makes sense that it's easy for your little one to sympathize with this dancing vampire. After all, we're all the odd one out every once in a while and at least we don't ever turn into a bat against our will! Your little one will love this sparkly black and pink dress. The pink top has a black collar with a skull in the center. 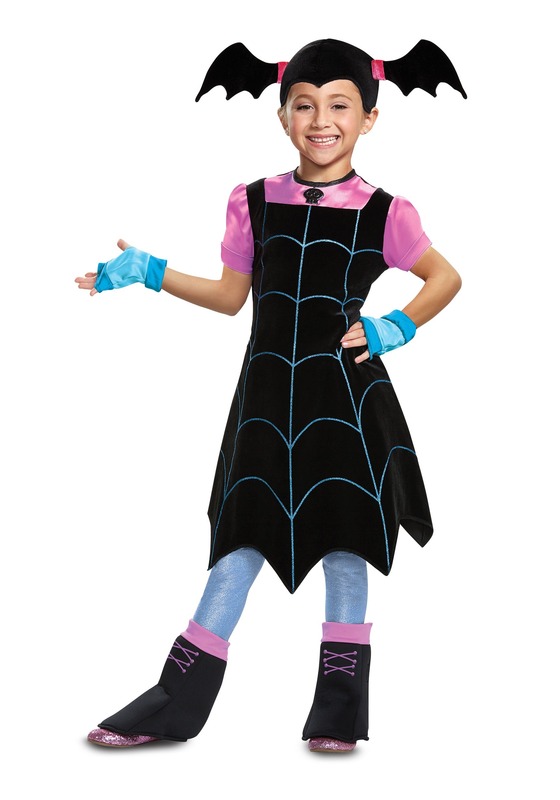 The black dress has a short velvet texture with a sparkly blue spider web pattern. The blue sparkly leggings will give your child Vampirina's pale look. The foam boot covers snap over whatever shoes will be comfortable for trick-or-treating. Top the whole thing off with the batwing hat and your kiddo will feel like the most magical kid in Pensylvania. If your little one is ready to dance and spook like our favorite little vampire then she'll love this costume! She might even want to wear it for playtime once Halloween is over. Understandable, the blue leggings are cuter than any other in her arsenal. As long as you make sure that you've cleared all of the garlic out of the house, it should be a good time!